Chinese Keys plant, Boesenbergia rotunda, is also known as Kra Chaai and Lesser Galangal. The roots, young leaves and shoots eaten throughout Asia in salads. Roots also used in cooking and sometimes pickled. Medicinal use of the root in China to treat colic and diarrhoea. Chinese Keys plant is native to Indonesia and prefers a moist, well drained soil in a protected, shady position. Frost tolerant but drought tender. 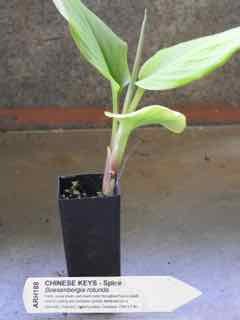 A perennial, deciduous, plant growing to 0.6m x 0.4m. Spikes of pink or white flowers. Be the first to review “Chinese Keys, plant” Click here to cancel reply.